Abstract: Web applications have become commonplace in the Information Systems curriculum. Much of the discussion about Web development for capstone courses has centered on the scripting tools. Very little has been discussed about different ways to incorporate the Web server into Web application development courses. In this paper, three different ways of incorporating the Web server are discussed: shared Web server (minimal student control), managed Web server (configuration control), and controlled Web server (full student control). 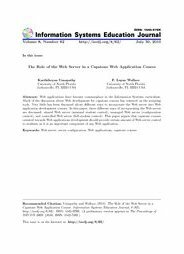 This paper argues that capstone courses oriented towards Web applications development should provide certain amount of Web server control to students as it is an important component of any Web application.